Karen Adrienne, a printmaker and member of the art faculty at the University of Maine at Augusta, visits Bates College to give a talk titled “Impermanent Art and Sustainable Community” at 7 p.m. Wednesday, Nov. 14, in Room 105 of the Olin Arts Center, 75 Russell St. The event is open to the public at no cost. For more information, please call 207-786-6158 or visit the museum Web site. 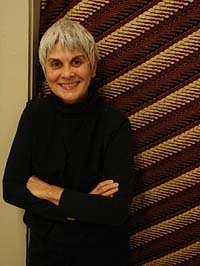 Adrienne is associate professor of art and coordinator of the Charles Danforth Gallery at UMA, and is the founder and owner of Artdogs, Inc., and co-owner of Circling the Square Fine Art Press, both in Gardiner. Her talk at Bates will touch on her conversion of the UMA art department to nontoxic printing media and her founding of Artdogs, a residential and studio space for artists. She will show some of her installation work and explain its conceptual relationship to Green Horizons. Green Horizons runs through Dec. 9. Museum hours are 10 a.m. to 5 p.m. Tuesday through Saturday.